If the disagreement was strong enough, we could end up pretty close to the borderline of incivility. 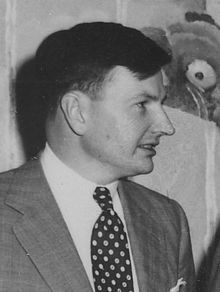 David Rockefeller, Sr (12 June 1915 – 20 March 2017) was a prominent American banker, statesman, globalist, and a grandson of oil tycoon John D. Rockefeller. We need governments of the world that work together and collaborate. But, I can't imagine that there would be any likelihood — or even that it would be desirable — to have a single government elected by the people of the world. I don't recall that I have said — and I don't think that I really feel — that we need a world government. We need governments of the world that work together and collaborate. But, I can't imagine that there would be any likelihood — or even that it would be desirable — to have a single government elected by the people of the world. There have been people — ever since I've had any kind of position in the world — who have accused me of being ruler of the world. I have to say that I think for the large part, I would have to decide to describe them as crack pots. It makes no sense whatsoever, and isn't true, and won't be true, and to raise it as a serious issue seems to me to be irresponsible. I think that one of the things that is needed is the fact that I don't think enough people in high positions in our country accept the importance of our world role with sufficient gravity. In other words, I think the tendency, because of politics and getting elected, is to stress local issues; and of course, they are important. But, I would like to see more of the leaders of our country spend more time traveling for one thing, getting to know the world, and studying history. To me, one of the sad things about our country is that our leadership — to a greater extent than I would like — is more concerned about very domestic issues than they are about our relations in the world. I think that that has to be related to the problems within our own country. I was reading in the papers today that there's a grave concern about what our role should be, how it should be handled, and how we should better manage our own domestic economy. And I think that this is becoming a serious issue. And it's gonna have to be addressed by any politicians who wish to be re-elected. They have to see that the issue of our economy and what influences it is better understood and more successfully addressed. I think that the best hope for peace and prosperity in the world is greater cooperation among nations, which in turn will be produced if both our governments and the people of our countries travel more and get to know each other better. For more than a century, ideological extremists at either end of the political spectrum have seized upon well-publicized incidents such as my encounter with Castro to attack the Rockefeller family for the inordinate influence they claim we wield over American political and economic institutions. Some even believe we are part of a secret cabal working against the best interests of the United States, characterizing my family and me as 'internationalists' and of conspiring with others around the world to build a more integrated global political and economic structure — one world, if you will. If that is the charge, I stand guilty, and I am proud of it. The anti-Rockefeller focus of these otherwise incompatible political positions owes much to Populism. "Populists" believe in conspiracies and one of the most enduring is that a secret group of international bankers and capitalists, and their minions, control the world's economy. Because of my name and prominence as head of the Chase for many years, I have earned the distinction of "conspirator in chief" from some of these people. Populists and isolationists ignore the tangible benefits that have resulted in our active international role during the past half-century. Not only was the very real threat posed by Soviet Communism overcome, but there have been fundamental improvements in societies around the world, particularly in the United States, as a result of global trade, improved communications, and the heightened interaction of people from different cultures. Populists rarely mention these positive consequences, nor can they cogently explain how they would have sustained American economic growth and expansion of our political power without them. Purported remarks at a Bilderberg Group meeting in Baden-Baden, Germany in June 1991, as quoted in Programming, Pitfalls and Puppy-Dog Tales (1993) by Gyeorgos C. Hatonn, p. 65 and various nationalist tracts. The ultimate source for the quotation (i.e. the person who passed it on to the public) is never identified. I think without internationalists like you, the international system we have been trying to build, the international system we have today, wouldn't be here. Far from having an attachment to the past and to its codes, David Rockefeller, and really all the Rockefellers, were perpetually falling for everything that was new. They embraced every new educational theory, every new artistic style, every new architectural trend, every new business fad. And so when the 60's came along and seemed to represent yet another bright new future, many of the younger Rockefellers embraced that too, even if it meant the destruction of their place in society, and the older ones had nothing to say. … there never will be another person like David Rockefeller, a person who epitomized the Establishment and attracted conspiracy theories by the score. In the 60's, a new generation came up to destroy his world, and in response, he was willing to come pretty close to the borderline of incivility. We now live in a world where we are related by economics, politics, the environment, technology and human nature. We can no longer think of the people and problems in other parts of the world as “foreign” to us. David certainly understood this early in the game, and has been a tireless and inspirational advocate in this regard. He wears the badge of "proud internationalist" openly, as do I. For David Rockefeller, the Presidency of the United States would be a demotion.